National Park Service estimated 8,000 attended the SOS March on D.C. rally and march "to protest the standardized testing mania that is at the heart of the Obama administration’s school reform policies" according to Washington Post blogger Valerie Strauss. Education Week reporter Nirvi Shah covered events here. Marchers reported that CNN was there too. The Christian Science Monitor, the most recognizable media outlet, reported the event here. The article titled "Save Our Schools March: a teacher revolt against Obama education reform" describes the event as part of a "nationwide push" agains the President's policies. "This is impassioned educators pushing back for good or bad," says Frederick Hess, director of education policy studies at the American Enterprise Institute (AEI) in Washington, who is generally an advocate of standards-based reforms. "I think it's clear that this isn't union power tactics." "There is a simple-mindedness, an arrogance, and a reflexiveness with which the reformers are pushing their agenda, particularly from Washington, and I think they've wound up giving classroom educators serious and fair cause for concern about how things like value-added evaluations or merit pay are taking shape," says Mr. Hess of AEI. "This pushback both helps call attention to the need to do this smarter and offers an opportunity to slow down and pursue these things with the deliberation and thoughtfulness they require." There is common unity across ideologies over the direction of current education reform initiatives. The public and taxpayers are not getting sufficient information on the rationale for expensive, increased standardized assessment regimes, starting at preschool ages with data collected in national student longitudinal databases. In these times of severe economic distress, how are such initiatives justified and what is their impact on students? During Senate education hearings last week, Secretary of Education Arne Duncan asked for more money, 13.3 percent budget increase over 2011, which would bring the department's spending one fifth higher than 2010 levels. "As every family is doing more with less, so should we," Duncan said. "[But] you can't sacrifice the future to pay for the present." He said the increase in spending would allow the department to fund the increased demand for Pell grants as well as reform early learning initiatives and the Race to the Top program." There are simply too many questions regarding the benefits and cost-effectiveness of increased federal intrusion into education. Will Congress look deeper and respond to growing concerns? Labels: Arne Duncan, excessive standardized testing, Race to the Top, SOS March on D.C.
NUT Report: Photos from SOS March on D.C.
Rally at the Ellipse followed by a march to the White House. Speakers at the rally included Linda Darling-Hammond from Stanford, Diane Ravitch, Matt Damon, and Rita Solnet, one of the co-founders of Parents Across America (Florida) and others. CNN reports on Matt Damon's participation here. No news if the White House has accepted a rescheduling of their meeting request. More details on this event as they emerge. Labels: excessive standardized testing, parent activism, Parents Across America, SOS March on D.C.
Saturday, July 30th, you can listen to a live audio feed of the SOS Save Our Schools March in Washington, D.C. by clicking these steps. Go to http://edtechtalk.com/studio, click on the UStream player on the right, and type your name in on the left (no password is needed) if you’d like to join a text chat. Events will be following the Twitter stream with participants on the ground call in and share. Coverage is announced to start around nine. Rally begins around noon at the Ellipse with a march to the White House. Labels: education reform, excessive standardized testing, SOS March on D.C.
Secretary of Education Arne Duncan found himself in the hot seat this week. At yesterday's Senate Education Appropriations Committee meeting, Senator Richard Shelby stated that the "Race to the Top" program extends the reach of the federal government too far into states' public schools. Senator Jack Reed also had some tough questions for Duncan on priorities and the loss of programs that worked in favor of experimentation. The video was posted in This Week in Education. The hearing was covered in the Huffington Post and repeated in Scathing Purple Musings. The Washington Post reports that Secretary Duncan met with some protesters associated with the SOS March on Washington D.C. Facebook postings report Duncan indicated there is common ground and agreement; however participants remain unconvinced. The meeting is the first acknowledgement by the administration of widespread national public concern over federal mandates and excessive testing initiatives. The March is scheduled for Saturday. UPDATE: SOS March Executive Committee declines White House invitation to meet today and requests a Sunday meeting or a date after the March. The committee invited the White House to attend the Saturday rally and listen first hand to concerns. Labels: Arne Duncan, Senator Jack Reed, Senator Richard Shelby, SOS March on D.C. I found the handful of posts on the SOS March on Washington found in Alexander Russo's blog interesting. Is it possible that journalists are completely misinformed about the reactions in communities across the nation to federal education reform initiatives? Or are these views part of a continuing pattern in the narrative by education reform advocates to trivialize and diminish the extent of public concerns over federal education reform initiatives. Instead of fact-based analysis, one journalist follows the "getting personal" track, commenting on Diane Ravitch and Whitney Tilson, two individuals I had never heard of until recently; whatever their "disagreement," it has no relevance to an examination of current reform initiatives. 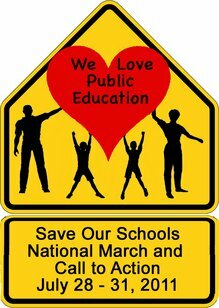 A few of the journalists/bloggers suggest the SOS March is a teacher event, and ignore the thousands of parents and community members who support it. Then, other commenters are clearly misinformed when they write that those who attend the event should have some solutions to offer. Solutions have been offered, supported by research and evidence and ignored. 1) Increased federally imposed standardized testing is unnecessary. There are sufficient assessments in place to provide data on student achievement. The so-called formative assessment is a wasteful effort. Now there is an initiative to have standardized data for preschoolers. Schools are already centers for test preparation and test-centric instruction. Simply stated, testing should not be increased and testing should not be the purpose of the classroom. 2) Accountability matters, but it must be reasonable and rely on the plentiful research and evidence that exists. The last decade of high stakes assessment did not yield the promised results. What benefit is there to continue this mandate that has a track record of negative results? 3) The use of student data to build a national longitudinal database on students from preschool through college is another expensive initiative with insufficient rationale. FERPA was enacted by the U.S. Congress to protect student information. A recent regulatory proposal by the U.S. DOE removes parental consent from the sharing of with some agencies. Is it reasonable for the public to voice concerns over privacy, security, and potential use of data on the nation's children? Tweet, fax, or call your federal legislator today and tell them these policies do not advance an educated population. Labels: education reform, excessive testing, Parents Across America, Race to the Top, SOS March on D.C. The U.S. Congress is accountable to the People and not to powerful corporate interests. The job of the People is to remind them of that fact. Living in a democracy is not easy and must not be taken for granted. The persistent trivializing of serious concerns over federal "education reform initiatives" and overreach by government is not acceptable. The intrusion of non-profits and corporate entities into educational public policy is not acceptable. At the core, democratic principles are at stake. At the center are the nation's children. Mainstream media has either ignored the concerns of parents, community members, and taxpayers or recycled education reform talking points and narrative. Bloggers, on the other hand, across ideologies, have done a great job at reporting facts and providing analysis. Market-driven education reform directed by corporate interests and brushing aside all other voices, parents, community members, taxpayers, and teachers aside is not a democratic process. States and local school boards are under incredible financial strain and reports emerge that many are defying federal mandates. State and federal legislators and the U.S. Department of Education collude with corporate interest to force experimentation, excessive, unneeded and expensive testing, and the development of a massive database from preschool through college on every child in the nation. There is no other option than to protest. It is a democratic right and sorely needed now. 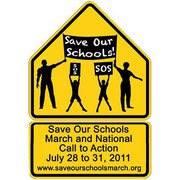 Support the SOS March on Washington D.C. on July 31. Watch for it on the news, look for blogs describing events, and then twitter those events to your legislators. How about a wave of 1 million tweets to the U.S. Congress? Fact-based and easy to understand. Grumpy Educators celebrates 100 blogs today. Here are some reports that are worthy of your time. "And in what ought to trouble conservatives and tea party followers, but really doesn’t (not yet anyway) “…developing effective teachers and leaders,” speaks to reformers “accountability” mantras. This is school reform code-speak for more tax dollars going for corporate standardized tests, elaborate software or training seminars. Or what Steve Wise cleverly described last February as “infrastructure,” on the floor of the Florida Senate." Missouri Education Watchdog posted information about providing public input by August 15 regarding Common Core initiatives in Register Your Written Opposition to Common Core Standards. Note an expanded call to action in an earlier post here. "A New York City program designed to improve student performance through school-based financial incentives for teachers did not improve student achievement, most likely because it did not change teacher behavior and the conditions needed to motivate staff were not achieved, according to a RAND Corporation study issued today." How many more studies does it take before meaningful accountability is formulated? There is no evidence of value-added measurement working anywhere, as currently designed. There is plenty of evidence that excessive testing is occurring. Recently, National Assessment of Educational Progress (NAEP) revealed results of geography achievement by U.S. students. Yes, that is another test administered selectively throughout the nation, roughly 30,000 of the 52 million attending school. The detail of those results were covered by Valerie Strauss in the Washington Post here. "NAEP, administered to nationally representative samples of students by the National Center for Education Statistics of the U.S. Department of Education, is sometimes referred to as the nation’s report card because it is the only K-12 assessment system given across the country. The 2010 assessment in geography was given to 7,000 fourth graders, 9,500 eighth graders and 10,000 twelfth graders." Which of the following is an accurate statement about the American Southwest? a) Alternating areas of dense shrubbery and sand dunes often make travel difficult. b) Arid conditions make access to water an important public issue. c) Generally fair weather means that most people rely on solar energy in their homes and businesses. d) Easy access to Mexico has led to a strong manufacturing sector. A brief presentation that is worth considering. What is it that we are racing toward at mach speed? TEA Party Nation Breaks Silence on Education Reform? "Have you heard something about a national education initiative titled: Race to the Top (RTTT)? Well this initiative was created from whole cloth by President Obama’s Secretary of Education Arne Duncan. Just as Obamacare is a federal takeover of our health care system, RTTT is the federal takeover of our public education system. The U.S. Department of Education created the Race to the Top program under the Stimulus Bill (American Recovery and Reinvestment Act, or ARRA) in early 2009. With a federal grant of $4.35 billion, Arne Duncan had a very large “carrot” to lure the states to enter into a competition for these funds in the name of 'education reform'." Florida TEA Party activists have been silent on Race to the Top and federal education reform initiatives in this year's legislative session. Last year, the Florida TEA Party opposed SB6, the legislative requirement to obtain federal funds. Curiously, this year, the Florida TEA Party supported legislative initiatives that mirror the Race to the Top proposal that won Florida the federal funds to implement so-called reform, but silent on the details. Is Dr. Swier's blog a sign that members of the national TEA Party are now taking a deeper look at education reform initiatives? Why did Dr. Swier look particularly at Florida? Whatever the answers, the blog adds additional clarity that across ideologies and across the nation, deep concerns exist among parents, members of the community, and taxpayers. There is plenty to be concerned about. Eyes directed toward Washington D.C. on July 31. The S.O.S. March on Washington brings those concerns to the doorstep of the policymakers and federal legislators. Will they maintain radio silence, ignore, and pretend there are no concerns? Have a giggle thanks to a FB "friend." Education Narrative Morphs: No Workers? Really? For some time, educational reform advocates claimed reform was urgent because the U.S. will not be able to compete in the global economy. I do not see that rationale used so much anymore, but I am noticing some new ones. A few weeks ago, I listened to a radio show that focused on new initiatives and partnerships between community colleges and the manufacturing sector. In that discussion, the lack of qualified workers was mentioned. Now, I find this same narrative repeated in a Business Week article here. Workers supporting the Space Program have been laid off in droves, across a large spectrum of skills, including engineers. University students are graduating and finding it difficult to get jobs. There are returning soldiers from Afghanistan and Iraq that also represents a pool that have qualified workers to fill these positions. In 2009, Business Week reported that there is no shortage of U.S. engineers in spite of what industry leaders claim. Sorry, if RightNow Technologies has to "burn through" so many resumes, but perhaps their Human Resources Department needs to change approaches. How about the local Workforce Development Office or Hire a Hero Program? Companies must also revisit their internal training programs; those investments have fallen off dramatically. There was a strong customer support employment base before companies began to ship them overseas, which had nothing to do with supply of workers and everything to do with cheap labor costs elsewhere. Under the current rates of high unemployment, filling current job openings is a rather cynical narrative to advocate for fast-paced education reform. Race to the Top for Tots: Don't measure the temperature of the fire – put it out! Last week I posted information about the new federal initiative to generate tests for preschoolers here. In these most difficult economic times, or frankly, in my view at any other time, there is no rhyme or reason for pouring millions into test development and particularly for under 5 year olds. The costs of implementing these tests will ultimately fall on local taxpayers and further impact school budgets. Stephen Krashen writes that this new and expensive testing will only tell us what we already know. His views are reprinted with permission. Your views? We already know that millions of children suffer from the effects of poverty: They are children from low-income families who are behind in academics, suffer from food deprivation and lack health care. Please see the careful and complete reviews of research by David Berliner and Richard Rothstein among others. We also know which children are in need and we know what to do about it. We don't need more precise data. The house is on fire: The US Department of Education's plans are like spending money on determining the exact temperature in each room, rather than rushing to put out the fire immediately. Instead of spending money dealing with the problems of poverty, we are giving it to testing companies who are eager spend billions of tax dollars creating expensive new tests and measures that will only tell us what we already know. See the details for yourself: http://www.ed.gov/early-learning/elc-draft-summary. With the debt-ceiling debate raging and the urgency to cut spending, the rationale and priority for a new Race to the Top pre-school standardized assessment initiative go unexplained. States will compete for $500 million in funds to develop tests that are intended to measure "academic performance but also children’s social, emotional, physical and artistic readiness for kindergarten." This assessment is intended to assist Kindergarten teachers in preparing targeted learning opportunities and are not to be used for any rewards or punishments for students, teachers, or schools. Critics howled. Early childhood development experts said preschoolers are too young to be evaluated by standardized tests in part because they don’t have sufficient ability to comprehend assessment cues. The plan was shelved. A recent article in The Nation notes concerns about this initiative. Concerns over inappropriate assessments of young children are rampant, so it bears repeating that appropriate kindergarten readiness assessments are not “tests” in the way adults might think of them. They do not require children to sit down with a bubble sheet and number-two pencil. Often they are based on teachers’ observations of children’s drawings or playtime interactions. For many literacy assessments teachers conduct them by sitting down with students, one by one, to ask them questions about sounds and letters or to point to pictures. The idea is to create a low-pressure experience. But there are still many questions in the research community about how to ensure that assessments are administered in ways that are sensitive to a child’s age and stage of development. 1) What is the problem this new assessment will solve? 2) Will the data collected become part of the State Longitudinal Database Systems? 3) Will the data be made available to other agencies and researchers without parental consent in accordance with the proposed regulatory changes to Family Education Rights and Protection Act? 1) No one knows, but it's expensive. 2) No one knows, change is hard. 3) No one knows, we have to do something. I am not an educator, not a policy wonk, nor a pre-K expert, but I am taxpayer and a NUT - No Unnecessary Testing. Peanuts anyone? In a continuing wave of protests, Chilean students demand education reform. On June 24, a protest reported up to 20,000 students, an event that turned violent. On June 30, the protest increased in size with a reported 80,000 to 100,000 students, lecturers, and parents demanding change. Chile's President Sebastian Pinera asked for the protests to stop and is proposing some changes, including a $6 billion dollar reform plan. However, student protests continue with a new twist. Two thousand students gathered in a kissing protest. The protests remain passionate, and no reports of violence or arrests. While the public's attention was riveted on the Casey Anthony trial and legislators fighting about the debt ceiling, bloggers following education reform lit up with breaking news all day. The two year investigation of test cheating concluded pointing culpability directly at Atlanta school district teachers, administrators, and senior officials. Atlanta Journal Constitution columnist Maureen Downey points to proving that "the faith of the Broad and Gates Foundations and the Chamber of Commerce in the district was not misplaced and that APS could rewrite the script of urban education in America and provide a happy, or at least a happier, ending for its students." Will these findings open an honest, fact-based debate on the way costly high-stakes assessment under NCLB and under Race to the Top proposals, have neither achieved accountability, nor affected student achievement? Who benefits from these misguided initiatives? Read the full Christian Science Monitor article here. While the education reform advocates continue a narrative that attacks Diane Ravitch personally, she continues to focus on the issues as she sees them. At a minimum, a factual understanding of her views is important; particularly when it comes to NCLB and teaching to the test. You may not agree with all of her views, but what the country needs today is a robust debate and analysis of current educational reform initiatives. Listen and decide for yourself here. When journalists delve into education reform, they refrain from analyzing the complexity of the issue and turn it into a personal attack on one person - Diane Ravitch. Rather than pointing out the evidence that supports the education reform positions, a familiar templated narrative is repeated. Just a few days ago, Ravitch met up with Wendy Kopp of Teach for America (TFA) at a yearly Aspen, Colorado event, which is attended by many notables; however the full discussion is not yet available. Ravitch raises important concerns that should not be hidden or ignored. View Diane Ravitch stating her position concisely here. Most enlightening to me is that Finland, the highest performing country as measured by international testing, does not invest in standardized testing at all. It is a reasonable question to ask why are we planning to increase testing? On June 24, Jeb Bush was challenged for his support for national standards as expressed in a recent NY Times op-ed in a post by Greg Forster, Senior Fellow at the Foundation of Educational Choice. On June 30, William Mathis of the National Education Policy Center reviewed the presentations Jeb Bush makes as he travels around the country marketing Florida's reforms as the model for success. "The mission of the Foundation for Excellence in Education is to ignite a state-by-state transformation agenda to “support reform, primarily based on the success of the FloridaFormula on Student Achievement” model. The foundation’s president is former Florida Governor Jeb Bush." Mathis states that "Jeb Bush's education foundation makes unsupported claims ignores facts to push agenda." "Fundamentally, Mr. Bush's presentation is based on the fallacious causal claim that his selected set of loosely coupled reforms introduced in Florida between 1992 and 2011 caused fourth-grade reading score gains," Mathis wrote in his review. "No evidence is provided to sustain this linkage. Further, this claim ignores the fact that some of the favored reforms were implemented as late as 2010, and some are not yet implemented." Mathis finds that Jeb Bush's claims are too narrowly focused on 4th grade reading scores and links great success, including improvements in the graduation rate, to selected reforms ignoring much else. Real problems are ignored. The most troubling aspect of the presentation is the avoidance of and failure to address real problems while, instead, embracing false solutions. This avoidance increases the likelihood that these real educational problems will intensify. Unfortunately, if research is our guide, the effect of the Florida reforms will likely prove to be a more inequitable and inadequate educational system. Read the June 30, 2011 review here. Governor Scott has an unexpected surprise. He chose the KIPP Impact Middle charter school as the location to sign Florida's education reform legislation. He likely chose the school because of the praise it received from Michelle Rhee and a visit by Arne Duncan. During Secretary Duncan's visit, the school was a beneficiary of $500,000 from the federal government as part of a $14 million dollar grant given to the KIPP Corporation. All this was before the FCAT scores were published. The school scored an "F." Oops for Governor Scott. Pretty far short? There really isn't any farther short to go. The narrative continues to highlight the overnight successes of charter schools eclipsing a more realistic view of accomplishments. In an accountability environment, cherry-picking is not honest. The fact is that charters are not perfect and not the silver bullet they are touted to be. Were it not for the continued reporting of overnight turnaround successes attributed to the KIPP model and the attention lavished on this particular school when it opened, Governor Scott would likely have chosen another place to sign the bill. Luckily, it shined a spotlight on a story that goes underreported. Hat tip to Scathing Purple Musings and Education Matters for reporting on the story. Cheating and demographics aside, Floridians are getting more evidence that charters are not the sort of panacea that school reformers what them to believe. 12 Noon, 2JUL UPDATE: Fifteen of thirty-one schools receiving "F" scores, were charter schools. This data raises serious questions. See the complete list here. The success of today's students will determine our nation's destiny. America's economic strength and standing in the world economy are directly linked to our ability to equip students with the knowledge and skills to succeed in the 21st-century economy. Bush and Klein argue that standards are being set nationally (in “common”) but pedagogy isn’t. Once again, let’s leave aside the reality that you can’t have national (common) standards while preserving freedom and diversity of pedagogy. Let’s pretend you can set national standards and then let a thousand flowers bloom on pedagogy. Why do it? Why is it valuable to set a single national (common) standard? The article’s title promises an answer to that question, but the article doesn’t deliver. "Joel Klein is the new education czar (CEO of the educational division) for News Corp, the parent company of WSJ. Those who have the media in their hands and foundation/government money behind them, plus other like-minded contacts in high places, exert an incredible amount of influence over education policy and funding. The WSJ op-ed by Bush & Klein made no case whatsoever to the rational person, as circular logic built on false premises is a conduit to deception." For a fact-based review of the Common Core Standards initiative, go to the Truth in American Education here. This four-page document provides pertinent information so that non-educators can understand. Read it and decide for yourself.